Delhi, the city of Love, the city of vibrant lifestyle is the capital city of India. It is something more than metropolitan and indeed teaches the way of life. Delhi is one of the most beautiful places to visit in north India. If you are confused what places to visit in Delhi, here you will find the list of top 20 places to visit in Delhi. 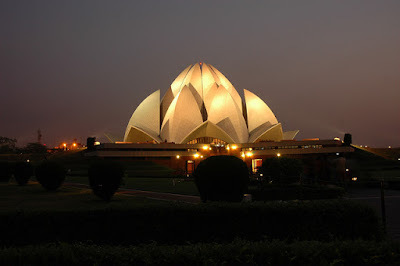 The House of Worship, the famous Lotus Temple in Delhi is the architectural masterpiece. On seeing the temple, you will shout out ‘wow’ but you have to maintain silence when you are inside. It is interesting to note that no ritualistic practices take place and the visitor may just sit and pray to his God. You may take part in the show teaching Baha i Faith, taking place daily. Undoubtedly, the Red Fort in Delhi must be added to the travel itinerary first. Constructed in the year 1639, it was the first fort ever made by Shah Jahan. Made from marbles and red stones, this fort is closer to New Delhi Railway Station and Old Delhi. Jama Masjid is the religion symbol of Muslim brothers. Constructed by Shah Jahan in the 1650s, the mosque is the most beautiful, famous and frequented. If you are an admirer of art, Jama Masjid is the must-visit mosque in Delhi. Yes! Who can miss out Qutub Minar in Delhi? The tallest Minaret in India rises 73 meters high and is the oldest monument of Delhi. It is one of the most visited places in Delhi. India Gate in Delhi is considered as the national monument of India where you may watch parade on 26th January. It was constructed in the memory of British Indian and Indian soldiers who gave their lives to safeguard the prominence of mighty empire. The inspiration is Taj Mahal and when looking at the famous Humayun Tomb you will feel as if you have visited The Taj Mahal. It is the home to the body of famous emperor Humayun. It is the leading travel destination which you cannot leave out. If you want to enjoy some relaxing moments, just head towards Lodi Garden. Lodi Garden is the beautiful blend of lush green parks and lawns. Chandni Chowk in Old Delhi is extremely famous for busy shops, delectable street foods, clothe and electronic markets. People from all across the globe flock Chandni Chowk to shop to their heart’s content. Akshardham Temple is popular for depicting Indian culture and has quaint and spiritual environment. Here you may enjoy Musical Garden, Landscape Garden, Cultural Boat Ride and plenty of shows and exhibitions. Your trip to Delhi is never complete without a visit to Connaught Place. Its location is central and there are world class hotels, restaurants, showrooms from where you may shop for products of your favorite brands. You may visit busy gardens, party all throughout the night and take part in the musical shows. • Lajpat Nagar Market is a wonderful market area for shopaholics. If you want to shop for ethnic wear, visit Lajpat Nagar Market. • Nizammudin ki Baoli is the most sacred places or mausoleums of India. The famous Dargah also featured in the song called ‘Kun Faya Kun’, Rockstar. • Take walking tour in Dilli Haat and experience the rich culture of India. There are food stalls serving delicious delicacies. • India Habitat Center is the place where you will find solar panels all over the roofs. There are also art galleries, several eateries here. • Rashtrapati Bhawan is the residence of The President but the mansion is definitely open for tourists. The energetic fountains and Mughal Garden add special charm. There are plenty of other places to visit in Delhi. But, make sure you include all the places mentioned above in your Delhi travel itinerary.